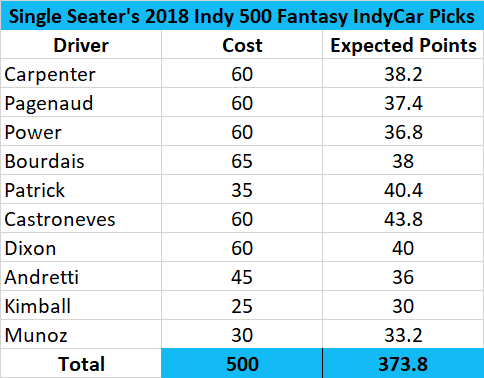 For the Indianapolis 500, Fantasy IndyCar managers have $500 to spend on ten drivers. Who are the best choices for the big race, and who should you leave out of this week’s lineup? Let’s take a look. First some track history. In the last five years the winner has started as low as nineteenth and as high as fourth. With The 500 being such a long race, no starting position is really out of contention for a race win or good result. Obviously it helps to be towards the front though: drivers who started on pole in the last fifteen years have the highest average finishing position–10.625–of any place on the grid. The driver with the highest expected points for the race weekend is Castroneves at 43.8. He is followed by Patrick who has an expected points value of 40.4 despite her over five year hiatus from IndyCar racing. This is because of her solid qualifying position and her previous experience at Indianapolis. In seven races at the track, she has finished in the top-ten six times. Other high ranking drivers are Dixon who starts Indy in tenth and pole-sitter Carpenter who has had limited success in past races on the 2.5 mile oval. Castroneves – with the highest expected points of the field, Castroneves is a good pick for Sunday. He had the highest speed in Saturday’s qualifying session and simply got the setup wrong on Sunday. Expect a good race setup from Team Penske for him this weekend. Dixon – he has four top-ten finishes this season and has had success in the past at Indy with a win and five other top-five finishes. This season he has had an incredible AFP of 5.8 so far. He comes at a cost of $60 along with the other two drivers in this category. Carpenter – the pole-sitter for this year’s race has an expected points value of 38.2. Carpenter hasn’t had much to be happy about at Indy (one top-five in fourteen races), but he is driving the only car to break 230 mph in qualifying and has looked fast through the practice sessions. He also ran well at Phoenix earlier this year, finishing P7. Patrick – she has a great expected points value at 40.4, making her a top contender for the race. The only reason she is in this category instead of the above is her long break between IndyCar races. However, with an AFP at Indy of 8.7, she might just be a perfect pick for Sunday at a low price of $35. Definitely an undervalued driver for this race and a strong pick for almost any team. Wickens – the IndyCar rookie starts midfield but could be a great pick this week. Although he has no previous experience at Indy, he did perform well at the short-oval of Phoenix this year, picking up a second place finish. He has also been almost unstoppable when he’s been “on” this season, picking up three top-five finishes in five races. And let’s not forget that he was laps away from a win in the opening race of the year before he got crashed out by Rossi. That would have (and should have) been a fourth top-five finish. Andretti – he is the ninth highest rated driver for this race with an expected points value of 36 and I feel good about his chances this weekend. He has had a fast car all week, especially in the tow, and will start on the fourth row. Indy has also been nice to him in the past as Andretti has placed in the top-ten 66% of the time and the top-five 42%. Daly – although a full-time driver a year ago, Daly hasn’t been able to put things together at Indy this year. He starts last on the grid and it doesn’t look like he has the speed to move up too much on Sunday. He goes for $25. Kaiser – with no past experience at Indy and a slow start to his rookie season, it’s best to leave Kaiser out of your lineup this week even though he comes at a low price ($25) for his starting position of seventeenth. I want to see more out of Kaiser before giving him the go ahead for any fantasy team. Rahal – Indy hasn’t been kind to Rahal in recent years. The American driver has just two top-tens in ten races and has failed to finish the 500-miler four times. With a starting position of 30th this Sunday and an expected points value of 23.4, things aren’t looking to be any different this year. Far too risky of a pick for his $55 value. 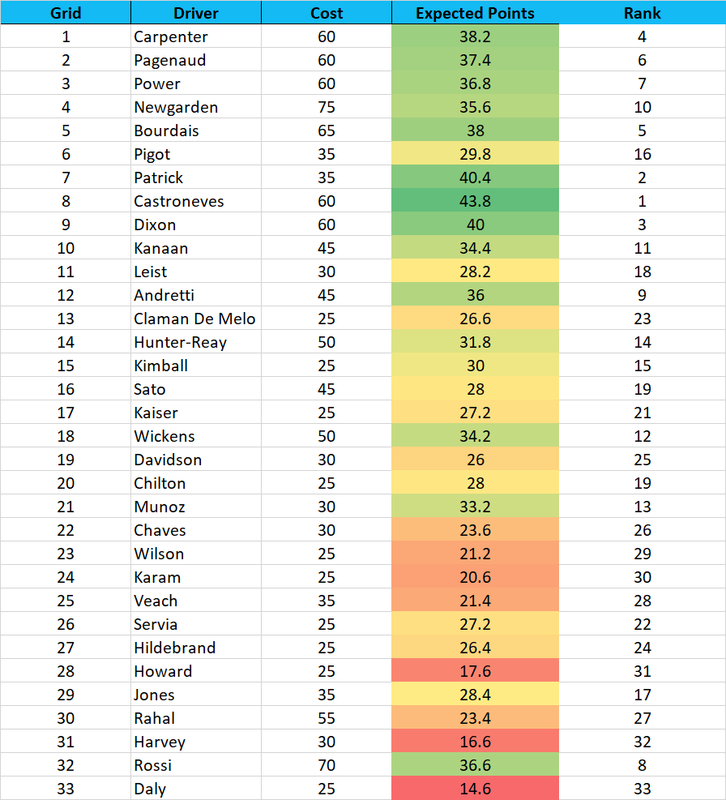 So now that we have our expected points for every driver for this race, who should we pick? What combination of drivers can we afford? This is the team I will be going with for the Indy 500! Let me know which team you decide to go with for the big race. If you have any Fantasy IndyCar questions, you can leave a comment below or contact me on Twitter. Best of luck in your leagues this week!